Add the serrano pepper, shallot and garlic to the bowl of a food processor fitted with the steel blade. Pulse for 15 - 20 seconds. Using a rubber spatula scrape the sides of the bowl. Add the sugar, Organic Seasoned Vegetable Base and lime juice to the bowl. Through the hole in the lid and with the processor running, slowly drizzle in the vegetable oil. Add the cilantro and pulse 2 - 3 times. Serve immediately with a salad or refrigerate until ready to use. Also delicious when used as a marinade with chicken or fish. To do so, simply omit the sugar from the recipe. 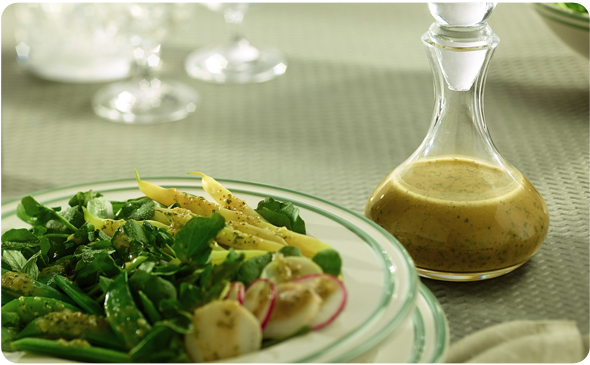 Try this dish with Better Than Bouillon Premium or Reduced Sodium Seasoned Vegetable Base.